Inventory We are a resale marketplace, not a box office or venue. Ticket prices may exceed face value. This site is not owned by Cross Insurance Arena . 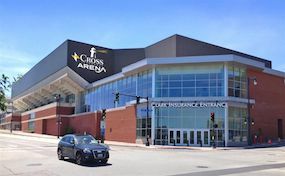 The Cross Insurance Arena is the premier venue in Portland, Maine. The Cumberland Center was built for $8 million in 1977 and opened with a performance by ZZ Top. The Cross Insurance Arena box office is located at 1 Civic Center Square in downtown Portland. The venue is scheduled to get a major face-lift with renovations that are currently in front of the center's board. The Cross Insurance Arena is home to the Portland Pirates of the American Hockey League. The seating capacity for concerts is listed as 9,500. The Cross Insurance Arena allows individual patrons to sponsor certain seats in the venue by engraving their names on them. ArenaPortland.com is an independently owned and operated company that specializes in the sale of all tickets in the secondary market. We are not currently affiliated with any primary website, box office, or official supplier. Prices can range above and below face value. To order tickets to all Cross Insurance Arena events simply pick up the phone and call our operators at anytime or follow the easy to navigate steps online.